kirin notebook - the blog of lara cameron: Ginkgo. Ink. This little bit of art has been a very long time coming. For close to 10 years now I've been thinking of getting a tattoo, but had no idea what I'd get done. What motif or concept I identified with and could have on my body for the rest of my life. 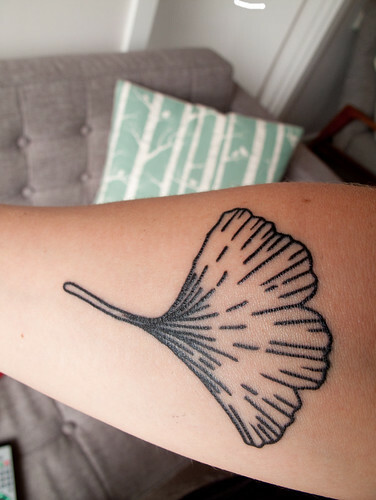 The idea of a Ginkgo leaf eventually came to me and became firmly planted in my mind. I could try and give you some spiritual or philosophical rationale for this decision and whilst there are many such reasons I really just love the form & concept of the Ginkgo leaf. It's beautiful. So then the question was where. Top of foot, ankle, calf, inside upper arm, wrist, forearm? I really loved the idea of wrist or forearm, but worried that it was too obvious, too showy, too difficult to hide away if need be. But then I realised: my Ginkgo leaf isn't something I need to hide. I don't have any grandparents to shock or potential employers to disturb. And I have fantastic parents who accept and support everything I do. I quite like the contradiction. Quite a few people have said to me "you didn't strike me as the type of person who'd get a tattoo". And I love that. Let it redefine your notion of tattooing, instead of me. I remember being very inspired last year at the Sydney Stitches & Craft show by an obviously classy and "well brought up" lady in her 40's or 50's with a tattoo of Florence Broadhurt's Japanese Floral on her inside upper arm. I loved that she broke the mold and did that. 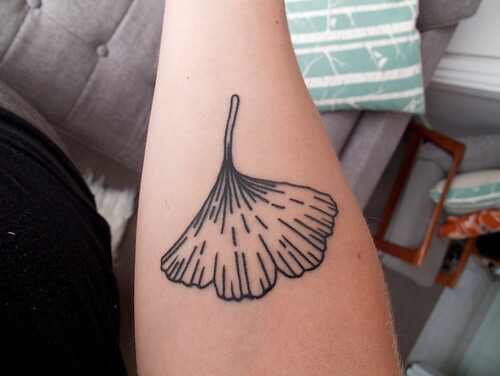 Ginkgo leaf tattoo - how I see it every day. I love it upside-down the most. I don't do regret. I may angst and fret about all sorts of things on a daily basis but when it comes to things that are permanent I'm very good at accepting them. Regret is wasted emotion. Every decision we have made in our lives shapes the present. To go back and change a single thing could change everything. There's no point living life in fear of regret. That's my philosophy anyway. All that matters is if you love it! But I think it's great!! I think it is beautiful! And I like it when people are surprised that I have a tatt. It is lovely! Great work by both the artist (you) and the tattoo artist. I love the placement on your arm and I must say - very ballsy for your first tattoo. I also love it when people are surprised to see my tattooed back. I think you put it perfectly - people should rethink tattoos not the person with them. That is so lovely. I would love to get a tattoo but I am a bit of a sook when it comes to pain. I love it and I love where you placed it! I have a ginkgo in my new garden and it is such a beautiful tree. Love it - great design and great tattoo work - too cool for school! I've wanted a tatt for years, but I'm such a chicken! Good for you. It's beautiful, Lara. I hear you...but I still wouldn't have picked you as a tat chick! I automatically go into the foetal position just thinking about it. Hehehe you ladies!! I should have mentioned that it really didn't hurt that much at all! Totally tolerable in fact. Thanks for all the positive words too!! It's refreshing to see an original tattoo. A for originality. I have two tattoos, one at my back and the other one in my angle, i just love and maybe......I still want one more...maybe someday. I love it! I have one tattoo but I have plans for at least 2 more! I mentioned to my mother last week that I wanted to get some more ink done and she said "why? Just think what it will look like when you are 80!". To which I said " when I am 80 I will look at my tattoo's and say 'what a great life I have led' rather than looking at myself thinking that I should have done this, or should have done that. Good on you for doing something you wanted to do. But I do warn you, it is addictive this body art thing! Congratulations on doing something exciting and new- and just for you. It's very pretty. I like your philosophy. Once upon a time I sketched a cicada that I thought would be perfect. The idea was, if I could look at it on paper and still love it as much as I did when I drew it years down the road, I'd go for it. Somehow it was lost... and with that, any desire to get a tattoo.. because THAT was the one. If it ever resurfaces, I'll know it was meant to be. One of my tattoos is on my forearm, and I'll never regret it. Your tattoo looks really good. Nice and crisp. People are always surprised that I have tattoos too. I have three, and one is very large. I got each of them at a time when I was comfortable with myself. They each represent to me a part of my identity, a part that will always be who I am. this tattoo is beautiful!! i love you ginkgo designs, and i love where you put it!! nice! Congratulations!! I think everyone should get a tattoo if they want it. Love it! I'm not a tattoo person myself, but one time I was at the RSPCA I saw a girl there with paw prints tattooed to her wrist. If I ever did anything it would be something like that. I remember you talking about it once but never thought you'd do it... Good on ya for getting your tat :) it looks great! Looks so good Lara! Hooray! Ahhh, you are very brave Lara. It looks beautiful! It´s beautiful, I love it! Like you, I´m thinking about getting a tattoo but havenºt made up my mind about the where and the what of this ongoing project. love the tatt, lady! very nice. Letincelle is one of my favorites on flickr. Beautifl detail and I love the placement! I also have a tat in the same area and just love it. jeez i ask mum if there's any news each time i skype but she never thought to mention my sis has got a tat! 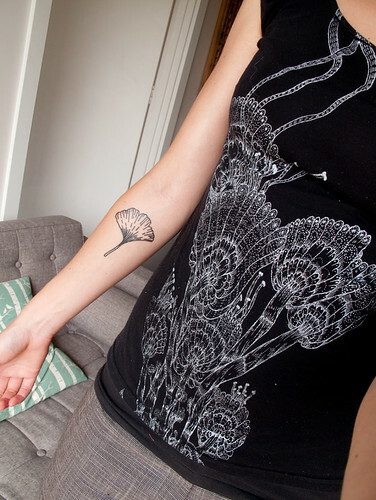 I am planing to make a ginkgo tattoo also. I thought I would be the first :)I love the shape of the leaf and it will also be my first one. Most exciting collaboration - Wall Stickers! !